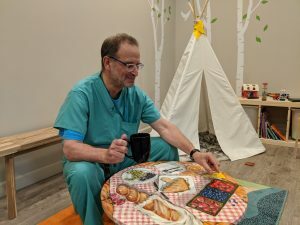 At Pediatric Specialty Partners, we believe that kids are happiest and healthiest in an attractive environment that encourages self-expression. We have decorated our office with art from San Diego artists of all ages. We would love to include your artwork as well! 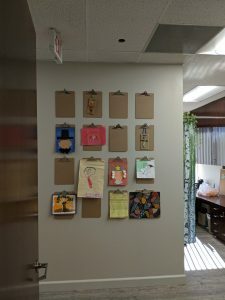 We love to display the creative and colorful work of the kids who come in. If you have a beautiful picture ready to come off the refrigerator or out of the schoolwork pile, have we got a place for it! How do we encourage kids to paint and not worry about the condition of our floors? Magic paper! Students of Chinese calligraphy use this material so that they can practice their brush strokes without wasting paper. 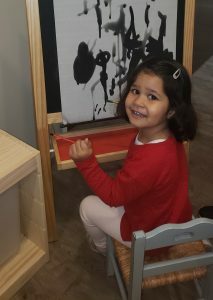 With a brush and some water, kids can create pictures which magically disappear as they dry. We get our scrolls from Asian Brushpainter. Kids (and adults) love to participate in the perennial picnic in our waiting room. We asked Angelina Pei, a student at Canyon Crest Academy, to paint this cheerful table. If you would like to have her paint something for you, you can reach her by email. 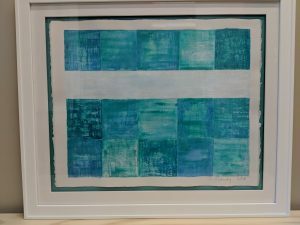 Locally based and internationally exhibited painter John Ratjakowski has graciously loaned us several paintings. You can enjoy his evocative work in the waiting room as well as in the hallway and in rooms 2 and 4. Multimedia artist Susan Pransky also has paintings here on loan. Her use of color and shape is accessible to children as well as appealing to adults. 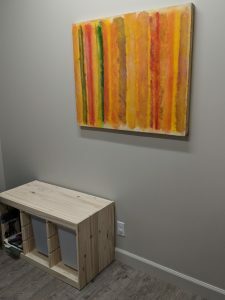 Her work hangs in the hallway and in rooms 3 and 4. We chose Naxos, a graphic designer based in Budapest, to create the design which represents our practice. We love how it can be interpreted in more than one way. When you look at it, what do you see?